Tires can get pricey, which is why many people opt for having their tires repaired rather than replaced to save money. But you have to be careful when you’re dealing with such a vital part of the car; a blown tire or flat on the middle of the freeway is no fun. When is it okay to have your tires repaired versus replaced? 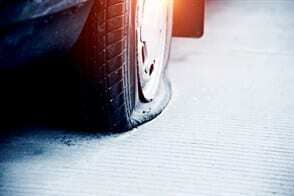 Driving on low tire pressure can cause severe damage to your tires. You can spot when tires have been driven on low pressure by the scuffing on the tire’s sidewalls. However, you can’t fully assess the damage from the outside. Often, driving on low tire pressure leads to hidden damage that can’t be seen without removing the affected tire. Before deciding whether to repair or replace the tire, have a professional remove it from the wheel and inspect the inside for hidden damage. The most common types of damage to tires are punctures and cuts. These often occur in parking lots and other slow-traffic areas where somebody left behind a sharp object, such as a nail or screw. If your tire is punctured in the right spot, and if the object that punctured it is small enough, you may be able to have your tire patched and continue driving on it for an extended period of time. If your tire is punctured in the thick part of the tread area rather than in the grooves, the puncture may be shallow enough to repair. If your tire is punctured by a thick object (greater than ¼ inch in diameter) in between the tread areas, it may need to be replaced. If your tire has been punctured for a long time and shows signs of wear near the puncture, the damage may be too severe to repair. These are all factors that can be determined from the external part of the tire. However, it’s best if you have a professional remove the tire and inspect it from the inside, as damage to the inside of the tire is ultimately the determining factor in whether or not a tire can be safely repaired. If you’ve ever bought a brand-new set of tires, you know how expensive it can be. When the damage to your tire is very minor, having it repaired is usually the smart choice. If your tire isn’t damaged too severely and is properly patched, you should be able to drive on it for a while longer without too much trouble. But the fact of the matter is that it’s not always worth risking further damage to your car or yourself or potentially getting stranded on a long drive. If your local tire shop recommends that you replace the tire, it’s a good idea to do so. There are some cases where the tire can probably be patched, but it’s questionable. In this case, you should just opt for a replacement tire to save yourself the time and hassle of dealing with another tire issue. Deciding to spend hundreds of dollars on new tires rather than having them repaired is a tough decision to make, but sometimes it’s the right one. If you have a puncture or cut in your tire that’s too deep, or if there is hidden damage from driving on low tire pressure, you should have your tires replaced at your earliest convenience.